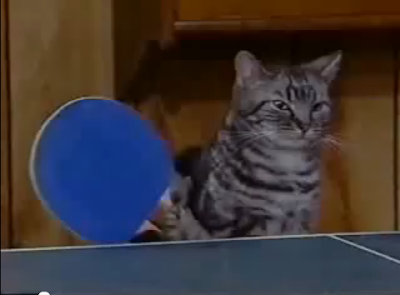 When a gif surfaced yesterday on BuzzFeed of two cats playing ping pong, it inspired me to seek out the original video of Toonces the Cat embroiled in an intense match against a ginger tabby named Spunky. Toonces was the star of a series of Saturday Night Live sketches from the early 90s, revolving mostly around the fact that he drove a car, albeit not very well. SNL has a history of funny (and strange) cat clips, but in my opinion, some of the best are their commercial parodies for products such as Feline Culinary Creations, a rip on upscale cat food brands like Fancy Feast, and Litter Critters, a fictional kit that turns Fluffy's litter box leftovers into toys for your kids. Do you have a favorite kitty-themed comedy sketch? I've seen a whole bunch, but I can't remember them at all now!